Images courtesy of Genuine Photography. 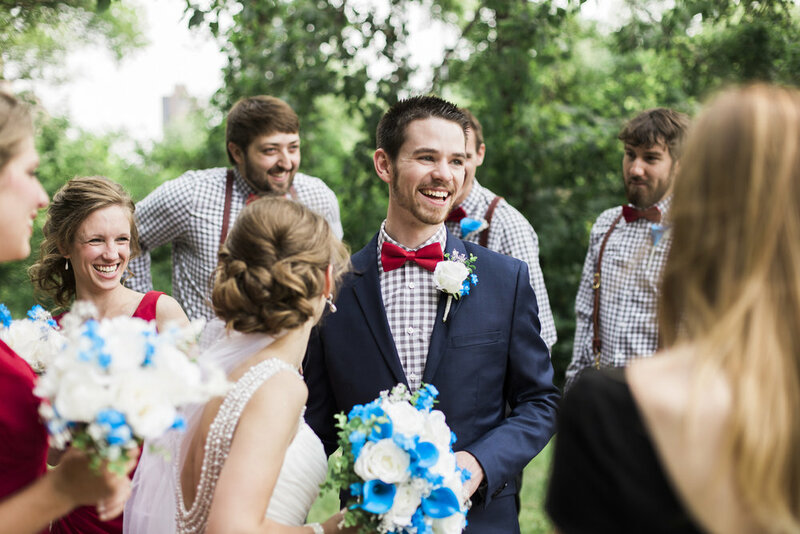 Katy came to me for her summer wedding here in beautiful Minneapolis with her fun and playful color palette of red, white, and blue! She knew right away that she wanted to feature a blue Calla Lily design to her arrangements and so I got to work to find the flowers to capture her vision. We settled on some classic white Garden Roses, blue Calla Lilies, blue and white Gypsophilia (baby's breath), and Eucalyptus branches. Katy wanted to make sure that her cascading style bouquet didn't overwhelm her petite frame, so as I worked on creating her custom silk bridal bouquet I sent her pictures so she could see how it was shaping up. As you can see from the photo above, we hit the mark on creating her bouquet with all the vibrancy she wanted without taking anything away from her winning smile and stunning dress. 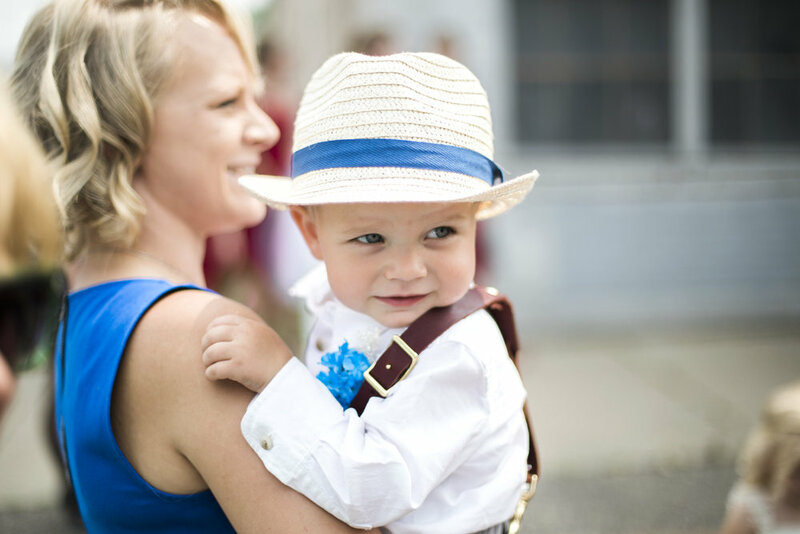 Katy's bridesmaids carried matching bouquets, the guys wore classically styled boutonnieres with Calla Lilies, and even the flower girls and ring bearer got in on the action with rustic floral headpieces for the little sweet pies and a mini boutonniere for the dapper lad. Don't you just love the blue shoes?? I would highly recommend Erin for your flowers. From the first phone call I made to her, through the entire process, she was great to work with, her prices were fair, and the flowers turned out beautiful! She designed the flowers for my bridal party, and even though we had a summer wedding, I knew I would save money by having silk flowers; plus, the flowers she uses look very real. Another reason we chose silk wedding flowers, is they don’t dry out and we could use them as an additional keepsake for those that were a part of our wedding! I have my bridal bouquet displayed at home, and my other bridesmaids have kept and displayed theirs too. You can spend so much money on bouquets and corsages that will only last a week. I wanted blue calla lilies, but these don’t exist. Erin found blue spray paint and made the white callas into blue! I want to say a huge thank you to the very talented photographer, Ashton, over at Genuine Photography. She was kind enough to let me feature her beautiful images here on my blog. Head on over to her fabulous website to check out some more of her dreamy photographs. And thanks again to Katy for choosing Love Is Blooming to create your custom wedding flowers and for being an active part of the design process! 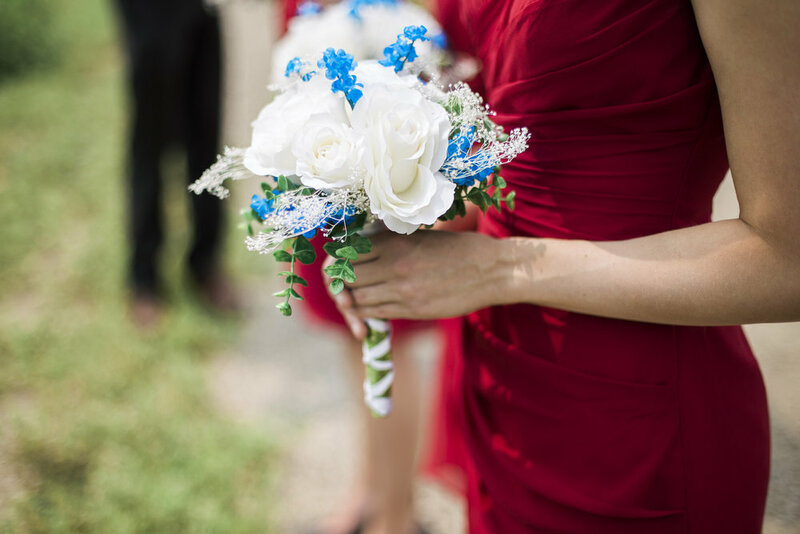 If you are interested in learning more about custom silk wedding flowers in Minneapolis, fill out the bridal checklist for a free quote.